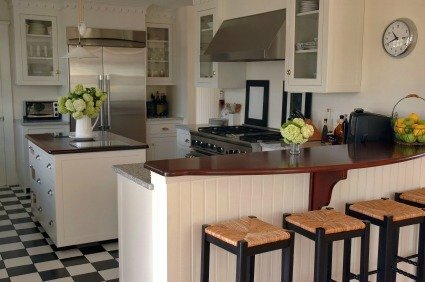 Cleaning kitchen cabinets and drawers inside and out will be appreciated by potential buyers viewing your home and will greatly enhance your kitchen decor. Don't let house hunters find your kitchen cabinets in less than perfect order. Expect home buyers to peer inside cupboards and drawers to see if there's enough room for their stuff. This is why the inside of kitchen cabinets and drawers should be as clean as the outside. See declutter your kitchen. When home buyers see your neatly organized drawers and cupboards, they'll have the impression that your home has been well taken care of. To make the job less painful, divide this chore into a couple days, maybe cleaning out the upper cabinets the first day, the lower cabinets the second. Remove everything from the kitchen cabinet or drawer you'll be working on. This is your chance to organize and purge yourself of stuff you never use. Get a head start on your move by packing up grandma's punchbowl and that huge turkey roaster you use only once a year. Clean kitchen grime around kitchen hardware too! Use a vacuum with attachment to remove crumbs and dirt from inside kitchen cabinets, or simply wipe out with warm soapy water and a damp cloth. Take this opportunity to clean the outside of the cabinets and drawers as well. When cleaning kitchen cabinets, be sure to get the “gunk” out of the corners of cabinet hardware and molding, as well. I like using moistened q-tips, as they won’t scratch the wood. For hard-to-clean square corners, a wooden toothpick will do the job, but be gentle so you don't scratch the wood or veneer. A toothbrush or small paintbrush will get the job done as well-- scrub gently with the toothbrush. To clean wood cabinets and drawers, use my all-time favorite cleaner, “Murphy Oil Soap,” multi-use wood cleaner. Spray directly onto the cupboards and wipe dry with a soft cloth. Don't rinse off. This product cuts through grease and dirt, and leaves a nice luster on cabinet surfaces. Smells good too! "Murphy Oil Soap" doesn't contain any wax, silicones or petroleum solvents. Wax can result in a waxy buildup with extended use, whereas silicone can actually harm the finish of the cabinets. Be sure to wipe cabinet hardware clean as well. Don't use dish soap on wood veneer and avoid saturating the cabinets, as it may damage the veneer. Use "Murphy Oil Soap" multi-use wood cleaner. You can find this product at most grocery and home center stores. Spray directly on the cabinets and wipe clean with a soft dry cloth. Cloth baby diapers are perfect for this job! Don't rinse off. Make up a solution of 1 tablespoon mild dish soap with 1 quart of warm water and wipe cabinets and drawers clean with a soft cloth. For stubborn stains, a window cleaning product like Windex may help. Spray directly onto the cabinet and clean with a rag. For grease stains, try applying a solution of 1 part white vinegar with 1 part water. Rinse with a clean rag. For sticky messes, mix up a paste of baking soda and water; scrub gently and rinse with a clean rag. Add 1 tablespoon of dish soap to 1 quart of warm water. With a clean cloth dipped in this mixture, wipe down the cabinets inside and out. Rinse the cabinets dry with a clean damp cloth, then wipe dry. To remove grease from laminate cabinets, mix equal parts vinegar and water in a spray bottle. Spray the affected area and let it set for 3 to 4 minutes. Wipe the cabinets with a clean damp cloth. Add 1/4 cup of white vinegar and 1 teaspoon of dish soap to 1 gallon of warm water. Dip a clean rag into the mixture, wring out and wipe down the cabinets. Continue in this fashion till you are finished. Let the cabinets air dry. Avoid using abrasive products on painted cabinets. Combine warm water and a squirt of dish soap in an empty spray bottle and shake well until combined. Spray down the cabinet surface and allow the solution to set for up to 5 minutes. Wipe off with a damp sponge or rag using large, circular motions. Rinse your melamine cabinets with water, using a clean sponge or rag, wiping with the same wide, circular motions. These durable and smooth manufactured kitchen cabinets surfaces can be cleaned with most nonabrasive household cleaners. Avoid using any cleaning products containing acetone, acetate or ethyl alcohol. Cleaning products with wax (and exposure to cigarette smoke) may discolor the surfaces over time as well, causing them to yellow. Cleaning is easy, simply use a clean damp cloth to wipe down surfaces. If that doesn't work, try "Murphy's Oil Soap," or other non-detergent cleaner. Apply the cleaning product to a clean cloth-- Don't spray directly on the cabinet surface! For stubborn stains, use mineral spirits (such as Nature Sol). The grease that collects on cabinet surfaces in the kitchen is difficult to remove, especially if it’s been sitting there gathering dust for a long time. Most often, soap and water, even elbow grease won’t get it off! Goo Gone Degreaser - Many people swear by Goo Gone-- I sure do! It’s one of my favorite cleaning products for grease and sticky stuff when all else fails. Apply it to stubborn greasy areas with a slightly damp rag. (A little goes a long way.) Let it set on greasy areas for about 30 seconds, then wipe off with a dry rag. Wash with soap and water to get the residue off, then rinse clean with clear water. Goo Gone also removes that impossible sticky residue left behind by stickers. Johnson’s Scrubbing Bubbles Bathroom Cleaner - This product isn’t meant to be used on wood cabinets, but I’ve been cleaning kitchen cabinets for years without any adverse effect. It works really fast on cabinets--don’t leave it on wood surfaces longer than 2 minutes! Scrubbing Bubbles cuts right through the grease and also works great on stovetops, rangehood grease, and the top of a greasy fridge. I wipe it off with a wet sponge or rag; rinse, wring and wipe. Rinse really well with clear water, then wipe dry. Citrus based spray cleaners, like “Orange Power” or “Orange Glo.” Follow product instructions. Mr. Clean “Magic Eraser” - Be gentle when cleaning kitchen cabinets with the eraser, as you may remove some of the finish from wood surfaces. You will be doing a lot of rinsing and wringing, and no doubt, go through plenty of erasers with this method. The eraser sort of disintegrates as you use it. Rinse cabinets with clean water. 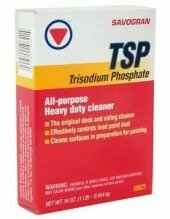 Trisodium Phosphate or TSP - This is a great cleaning product for getting grease and cigarette stains (and odors!) off surfaces before you paint them. You can find it any home supply center. Mix it with water, according to instructions, then wipe surfaces with an old rag or sponge. Be sure to wear gloves when using TSP. Wipe the cabinets clean with clear water. Powdered dishwasher detergent - Dishwashing detergent is formulated to cut through grease. Sprinkle a little detergent onto a warm wet rag. 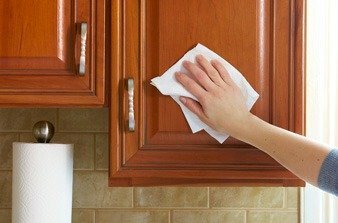 Wipe down the greasy areas of the kitchen cabinets. Rinse the rag, wring and sprinkle on more detergent. Continue in this fashion. When the grease is all gone, rinse cabinets well with clean water, making sure to remove all of the dishwasher detergent residue. User-friendly products - “Simple Green.” Just spray it on and wipe off with a microfiber cloth. Or make a paste of baking soda and water, apply to greasy area and let set for a few minutes. Wipe off with a damp rag. After your wood cabinets are clean, you will want to condition them with furniture oil. This will give your kitchen cabinets a nice luster, which will add to your overall kitchen decor. Murphy Oil Soap” multi-use wood cleaner -Spray directly onto the cupboards and buff well with a soft cloth. Old English Lemon Oil - Old English Lemon Oil will make your cabinets glow. Apply the oil to cabinets with a dry, absorbent cloth and buff until the surface is dry and has a nice sheen. Home-made wood oil - In a jar, add 1 part white vinegar to 3 parts olive oil, (the cheap kind!) Shake well and apply to kitchen cabinets with a soft rag or microfiber cloth. Buff dry. Watch the video below to see how you can breath new life into scratched-up kitchen cabinets, by applying "Old English Scratch Remover." I use this treatment on my antique wood furniture, piano, and kitchen cabinets about once a year. This video is presented by kidsmartliving.com.